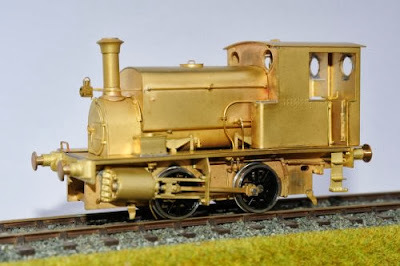 Ixion has received word from Chris Basten at Dragon Models, Wales to say that he has sold his last remaining finescale 7mm brass 'H' Class Manning Wardle 0-4-0ST. This means that the loco has now sold out worldwide. Ixion is prepared to consider a re-run of this loco in 7mm scale if there is sufficient interest. If you missed out, and would like to obtain one, please email info@ixionmodels.com to register your interest. We would also be interested in hearing what livery you would like; possibilities are unlined apple green, unlined black, and lined blue. Ixion has also been approached to ask whether we would consider manufacturing our Manning Wardle in Gauge 3 (13.5mm/foot, 1:22.5 scale, 63.5mm gauge). We are canvassing the membership of the Gauge 3 Society via their Journal to gauge the level of interest. We would like to know what kind of power (track or battery) and control (DC controller or RC) purchasers would prefer. Because of our commitment to our current program of mass-produced models, this loco would be manufactured to order, and only for pre-paid customers. The factory has indicated a minimum run of 50 locos is desirable. Once we have the specifications settled, we can ask for a quote which will then give us a price. We have no idea what that would be at the moment! To register interest in this project, see the G3 Journal (if you're a member) or email info@ixionmodels.com if you aren't.